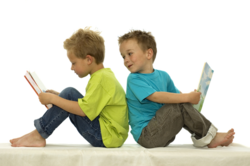 This is the last article of a three-part series on reading aloud with students. If this is your first visit to the series, you might want to access the earlier articles. I hope by now that you've been practicing new and improved strategies for reading aloud in your classroom. Below is a simple list to help you make every read aloud count, and to assure your principal that you are focused on meeting standards. The list is not intended to be extensive or all-inclusive, and the ideas work with all ages of students. The ideas simply target common skills and standards, and provide methods for teaching them through reading aloud to students. Use these as a jumping-off spot to get you thinking about your state core curricula, your students' needs, and how reading aloud can effectively address those. * Hoyt, Linda. Interactive Read Aloud. Boston: firsthand (a division of Houghton Mifflin Harcourt), 2007. * Hoyt, Linda. Spotlight on Comprehension. Portsmouth, New Hampshire: Heinemann, 2004. * Beck, M. McKeown, and L. Kucan. Bringing Words to Life: Robust Vocabulary Instruction, New York: Guilford Press, 2001. Rhyming words and alliteration can reinforce decoding skills. Play a short pattern recognition game where students think of every other word they already know with a similar pattern to the just-introduced word (i.e., the blend br brunch is also in bring, brown, bride). NOTE: These small insertions must be viewed by students as the teacher sharing -- merely an aside in an ongoing conversation. Delivery like that takes practice. (You might want to use a few minutes of staff meetings to model and critique one another on this fine point; everyone's read aloud sessions will benefit.) The most successful teachers use read alouds as a tool without them looking like an obvious lesson. The magic words are always "Let's see what happens next" to draw students back into the story. Start with short pieces (even if you are reading to middle or high school kids). Pick enticing text that has rhythm and subject matter meaningful to your students. Concentrate on making your read alouds an active -- not passive -- experience for your students. Stop at a cliff hanger moment that will leave your students wanting more. We discussed briefly Beck, McKeown and Kucan's work related to Tier II words in the previous article in this series. Target those words when pre-screening the read aloud and introduce the words before reading, or during the reading itself. Always find other connections in the school day to reinforce new words. Choose rhythmic poems and narrative for this purpose. Allow students to repeat key phrases whether they are readers or not (as a quick aside to fluency practice at other points of the day). For older students, make it a theatrical event. Explain what you are doing when you chunk words and phrases. I liken my delivery to performing on a stage. Let read alouds move into Readers Theater presentations with your students presenting the read aloud. Use students' favorite song lyrics and rap music as well as conventional text. Here is where think alouds are priceless. Show students how thinking, wondering, and pondering readers read; figuratively split your brain open so they can see the functions and cognitive activity behind reading. Open your heart and your mind to students. Don't limit yourself or your students to regurgitation of facts or obvious "only one right answer" responses. But she wasn't crushed. No wheels had rolled over her daylily dress. No sign of big damage anyplace. No outward sign at least. John's use of varying sentence lengths, his repetition of the word no, and his use of alliteration are all key elements students can use in their own writing. Remember to embed those teaching moments seamlessly into your interactive reading. Make them part of your lesson plan to reinforce connections to standards, but never forget that your aim from the students' perspective is to appear to take your educator hat off and put on your "I'm a reader, too" hat. That's the surest path to helping students learn to appreciate text at a new level. You'll be putting them on the road to falling in love with words. Cathy's freelance writing appears in such print publications as Atlanta Our Kids, Omaha Family, and Georgia Journal of Reading, and online at Literacy Connections, Parenthood.com, Education World,and the Reading Tub. She also reviews children's books at Children's Literature Comprehensive Database. Her signature is her passion for connecting children and families to positive, powerful experiences with reading; she believes there is a book for every child. Visit Cathy's Web site at The Literacy Ambassador.